Boscobel senior Leah Wacker, front row center, became the second player in program history to score 1,000 points in a Bulldog win over Iowa–Grant on Dec. 3, 2018. 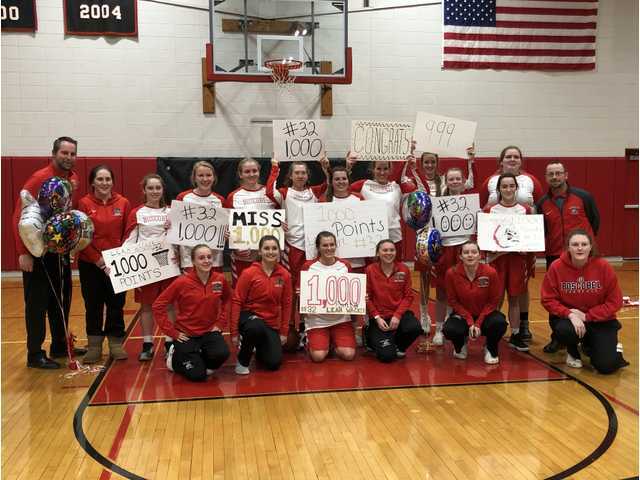 POSTED February 25, 2019 10:33 a.m.
Leah Wacker did something that has only happened one other time in Boscobel Girls Basketball program history when she scored her 1,000th career point Monday, Dec. 3 at Iowa-Grant High School, where she led her team to victory with a team high 17 points. Leah hit her milestone midway through the first half with a deep, 3-point shot, and the Lady Bulldogs went on to win, 50-38. This journey started about a week before her freshman year when I called her on the phone and told her she was going to play varsity ball. I had to hold the phone back about five feet from my ear due to the excited scream on the other end. I had no idea at that time that she would go on to score 1,000 points and counting. It wasn't easy for her either. She has had to work extremely hard to accomplish what she has. Leah was and still is always trying to get in the gym to work on her game. I can't tell you how many times she would text or called me to open the gym so she could get some extra work in. When you see someone with that passion it's pretty easy to want to try and help them as much as possible. Not too many players score 1,000 points and I am lucky enough to be able to have been a part of it. I just can't tell you enough how special it is. Leah would be the first to tell you that she didn't do this by herself. She has had help along the way—from her family, her teammates, youth coaches, her current coaches and many others. I myself and we as a program are very proud of what she has accomplished. Last night in the locker room prior to taking the floor, it was pretty special to watch Leah's teammates excitement for her and what was about to happen. It was almost as if all of them were scoring their 1,000th point. And once she did score that magical point late in the first half her teammates went crazy with excitement. This journey had been four years in the making and has been worth the wait. Of course Leah would have preferred it sooner, but who wouldn't? All I know is that all her hard work and dedication has paid off. And again it wasn't always easy. To watch her grow into the player she has become has been a joy and a privilege. I am so proud of her and this moment will always have a special place in my heart. I know if Leah could give young players one message, that message would be work hard and don't give up because you can accomplish great things if you dedicate yourself. I want to thank the fans that were able to come to the game tonight for being a part of a very special moment in program history. Awesome job Leah and way to go!